The same clothing by Ha Ji Won and Han Ji Won of MBC’s “The King 2 Hearts” and SBS’s “Rooftop Prince” immediately attracted the attention of the audience. The two actresses have chosen the sweaters with the combination of soft yellow, but Ha Ji Won’s demonstrating feminine charm, and Han Ji Min’s showing a lively feeling. 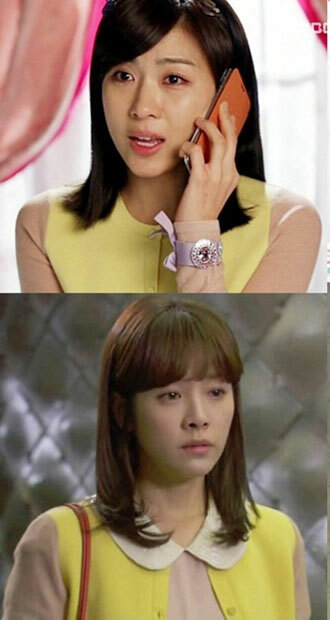 In episode 5 of MBC’s “The King 2 Hearts”, Ha Ji Won debuted with a soft-color sweater which demonstrates feminine charm and wristwatch, the style is simple and made Ha Ji Won full of femininity charm. In episode 10 of SBS’s “Rooftop Prince” aired on April 19th, 2012, Han Ji Min who is preparing to date with Park Yoochun also chose the same sweater, but what’s demonstrated by Han Ji Min is another kind of lovely and lively feelings. Although both is wearing the same clothes, but give a different charm.